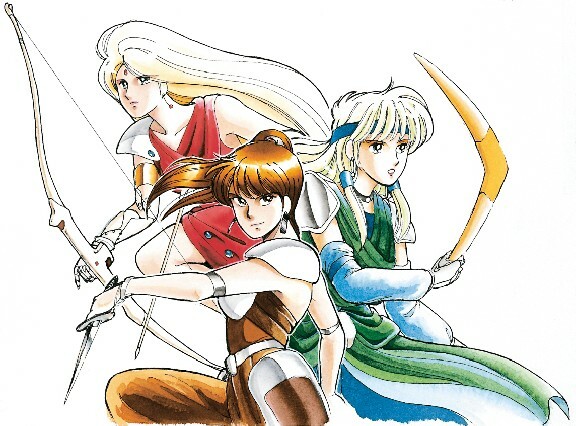 The ladies from the later generations of the Phantasy Star III story were featured in only a few pieces of artwork from the game's manual. This illustration combined three of them at once. This trio makes for an odd combination, given the conflicts between Layans and Orakians in the game world. Even more so, if you consider that Alair was a complete non-combatant in the story. Nonetheless, they are quite impressive. Together, they would be able to overcome most villains found on the Alisa III. We can also gather some insights on Layan weaponry from this picture. Laya and Alair both appear to be wearing an armored glove. In Laya's case, this gauntlet would protect her forearm from the fast movements of her bowstring. The bow is also held from a handle on the side, rather than a grip directly on the length of the weapon. Alair appears to be carrying her brother's weapon. Lune's Slicer is one of the legendary weapons gathered by the third generation of heroes, but can be seen in Lune's own hand during the climax of Nial's second generation adventure. The simple boomerang shape is far different from the complex sphere with rotating blades shown in the manual's weapons section.